Some 1,700 years have passed since Emperor Constantine granted Christians the right to believe in God, yet "the persecution of Christians has not ceased"; thus, "the Church of Christ will never cease to generate martyrs" until God "enlightens everyone, so that they understand that peace, reconciliation, tolerance, meekness, and mercy can only have a positive effect on human society in general, especially in terms of deeds and words." Religious freedom and the journey of a divided Church "towards unity according to the Lord's command" are central to the thoughts Ecumenical Patriarch Bartholomew I expressed this morning at the ecumenical prayer that saw him in Milan's Basilica of Sant'Ambrogio in Milan, together with Cardinal Angelo Scola. 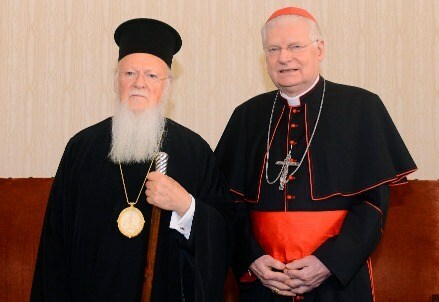 The celebration of the Edict of Constantine is behind the Ecumenical Patriarch's visit to the Archdiocese of Milan. For the Orthodox Church, the emperor is a saint, and the event provided the two 'sister Churches' an important opportunity to reaffirm their ecumenical will. Indeed, the patriarch's words and attitudes are evidence of this, as are the "fraternal greetings" Pope Francis sent him yesterday. The spirit of the Constantinian document issued in the year 313 naturally centres on religious freedom. If in his message Pope Francis expressed hope that "today as then, the common witness of Christians of East and West, sustained by the Spirit of the Risen One, can contribute to spreading the message of salvation in Europe and throughout the world and that, thanks to the far-sightedness of civil authorities, the right to public expression of one's faith is respected everywhere and the contribution Christianity continues to offer to culture and society of our time is welcomed without bias," Bartholomew noted instead that, "with great sorrow today we see Christians, of all denominations, persecuted in many places, deemed enemies of society and the state; [we see that] the Christian faith is not tolerated in many countries and under many laws. Despite the progress apparently noted in the world with regard to respect of human rights, the persecution of the Christians has not ceased." Similarly, Card Scola noted that "such freedom is trampled upon in many different ways, from martyrdom in the lands of the Middle East to legal obstacles that prevent its full implementation as sometimes happens in Europe." The patriarch's visit begun yesterday with a celebration in the church of Santa Maria Podone - which the diocese gave to the Orthodox community - and continued in the afternoon in the Hall of the Caryatid in Milan's Royal Palace, Bartholomew and Card Scola gave keynote addresses on the topic of religious freedom as a fundamental right from which stem all other human rights. Today, the Patriarch stressed the "great benefit" the Edict of Milan offered humanity. "For the first time, religious freedom was enshrined into the law of an Empire, the Roman Empire, which then influenced 'the fate' of the world. Because of this freedom that had been given, and thanks to the reforms of Constantine the Great at all levels of legislation and life of his empire, under the strong influence of Christian teachings, the bases and foundations of basic human rights were laid." "However," he added, "the laws are unfortunately changed on the whim of those in power. Sometimes for the better, but most of the times for the worse, under various pretexts, when it comes to human rights. We have all experienced, even today, the will of those in power and those who have rejected and denied from the start the Christian message of love and sacrifice." Another aspect of Constantine's work that Bartholomew highlighted is the fact that "the Emperor was very interested, and rightly so, in the unity of the Church, which presupposes unity in faith, without which it is essentially impossible. Constantine the Great understood the need for spiritual unity among his subjects, as a commitment to the prosperity of the state, and as his ardent desire to see the people of his empire united under one and only guide of life and love, our Lord Jesus Christ." "The organisation of a united Christian empire was part of Constantine the Great's broad vision, in which peace, fraternity, solidarity, harmony and love would have reigned. Certainly, without such a vision, today's Europe, speaking by analogy, would not have this spiritual heritage. The world too would not have caught with the same depth the spread of the Christian message on God, man and the world, a message that has and should have the single purpose of man's deification man. With faith, man conquers selfishness, leaves the bounds of the "self", and enters a new transcendent reality, in which new laws are in place: "the old things have passed away; behold, new things have come'(2 Cor., 5:17-18). Bartholomew concluded by saying, "By living according to the commandments of the Holy Gospel and acting with wisdom and continued sanctification, we are trying not to let fear stop us from resisting the destructive power of globalization and material life in today's world-with, as our role models, Constantine the Great and of Saint Ambrose, whose relics are preserved in this temple 'to cheer and delight' all our hearts, collected in order to announce 'what is to happen to you in days to come' (Genesis, 49:1)."